Today's photo was taken just a little way from the photo in this post; in the distance, over the ocean, you can see Hout Bay. The route from Kommetjie to Hout Bay has one of the prettiest views in the country - it's the famous Chapman's Peak Drive (M6), which you can see on this map. Check out the Chapman's Peak Drive website for information on whether or not the road is open (it sometimes closes in the event of rockfalls), the toll cost for using the road, and beautiful photos taken from the many viewing spots along the way. In good weather, Chappies (our affectionate name for the road) is definitely worth the trip and the small toll charge. It may even be a cool idea to visit Cape Point in the early morning, take the coastal road past Scarborough through to Kommetjie and Noordhoek, and then head over Chappies and have lunch in Hout Bay. 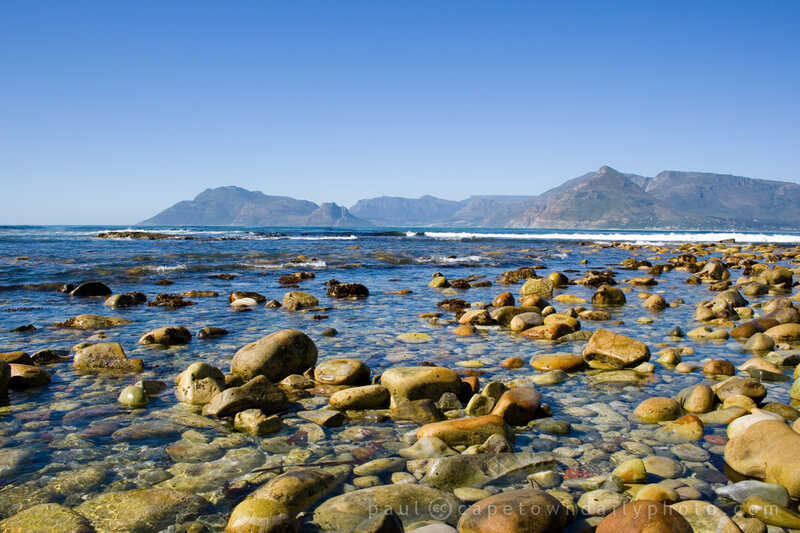 Keep in mind that there's lots to see along the way, so you may only end up in Hout Bay for a mid-afternoon lunch. If you're unfamiliar with the route, take a look at this route map that I drew using Google Maps. Posted in Landscape and tagged route, sea, water on Wednesday, 13 January, 2010 by Paul.